Rustic River Resort, an RV Resort on the shores of the North Saskatchewan River. With over 180 acres of secluded parkland and 2kms of shoreline on beautiful North Saskatchewan River, Rustic River Resort is the perfect family getaway for boating, swimming or just relaxing. Kids will love the variety of summer activities throughout the season. Anglers will love the great fishing on the North Saskatchewan River. Whether it’s singing by the campfire, pitching horseshoes with friends or getting out on the water, Rustic River Resort Ltd. has something for everyone. Rustic River Resort offers rentals, RV sites for overnight, short term and long term lease; a general store and liquor store staffed year round by professional managers to assist you with your needs. We offer a wide range of facilities and amenities to make your getaway easy and enjoyable. 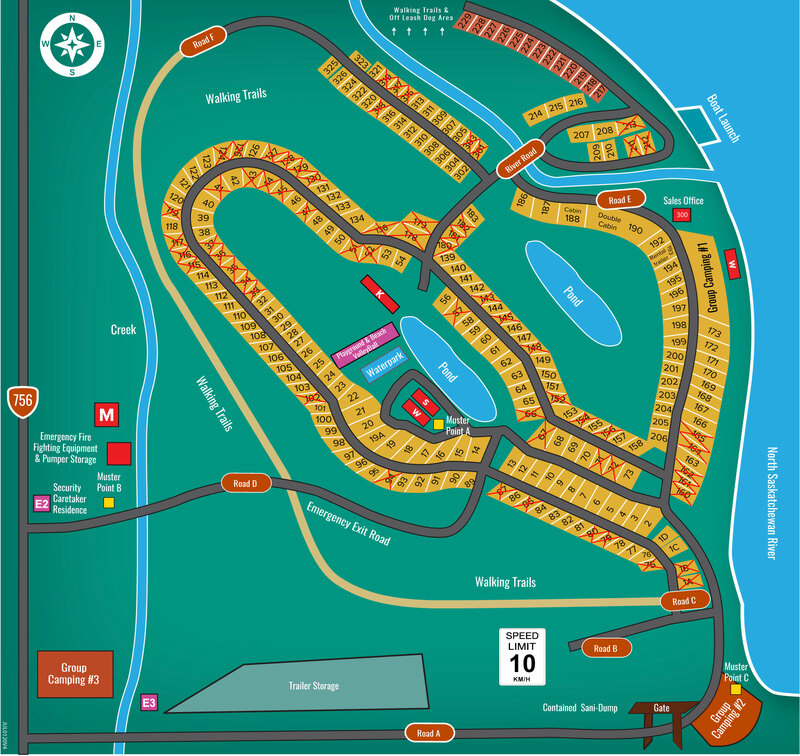 Everything you are looking for in a Campground! ✓ 6 stalls x 30 amp with water to plug into right around the cookhouse or a combination of RVs and tents. For each RV stall, you can have 2 tents. Example: 3 RVs and 6 tents or 1 Rv and 10 tents or 12 tents in total and so on. For each extra tent $30 , each extra RV $60. ✓ Group camping covered kitchen includes Satellite TV, big fire pit, pots, pans, kitchen utensils, industrial size freezer and fridge, smoker, stove, oven. 3 bags of ice per day during your stay. ✓ Cabin with 2 suites comes with this group camping area. ✓ Perfect for loud campers! ✓ Base price for this group camping area is $275; for 5 RVs or 10 tents. Maximum allowed for comfort is5 RVS but can have up to 15 tents. Extra tents are $30. Are you ready to create some unforgettable memories?